Professional pilot Melissa Chalmers has moved twice in 10 months to escape wireless radiation and worries she’s running out of places to hide. The commercial pilot of 20 years is on sick leave. 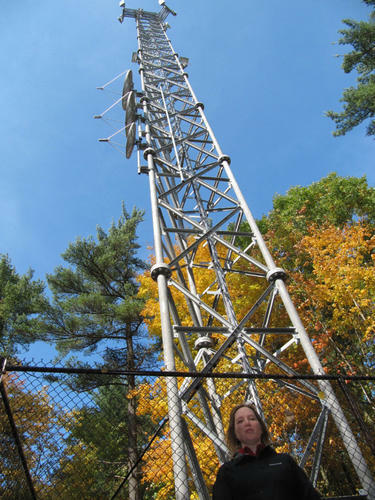 She suffers from sensitivity to electromagnetic waves — the invisible waves given off by almost everything electric, in particular, those emitted by communication towers that are popping up across Canada. Chalmers, who lives near Grand Bend on Lake Huron, may be moving again because of a new a cell tower not far from her forested home. “They have put a tower up down the road. I’m just waiting for it to be turned on and then I will probably have to leave the home,” she said. Chalmers first noticed, about two-and-a-half years ago when she lived in London, that the nausea she felt when she was in her apartment subsided when she left. Cellphones, cellphone towers, wireless internet routers, cordless phones and power lines have all been recognized as possible contributors to electromagnetic hypersensitivity (EMS), which is caused by significant exposure from radio waves. EMS symptoms include poor sleep, fatigue, headache, nausea, dizziness, heart palpitations, memory impairment and skin rashes. Dr. Riina Bray, medical director, Environmental Health Clinic, Toronto’s Women College Hospital, is a leading physician on EMS and its symptoms. “I’m just basically seeing more and more folks with electro hypersensitivity . . . there is a small fraction of the population who are hypersensitive and the WHO (World Health Organization) supports that phenomenon as being real,” she told the Star. Critics say if Industry Canada, which has total control over telecommunications, has its way there will be no place for people such as Chalmers to live. Industry Canada did not respond to a Star request for an interview. Bray said the public should not have to prove harm. “It should be done by industry and government,” she says. Municipalities that have tried to control the number and location of cells towers say Industry Canada has told them it would block any attempt to usurp its powers. The municipality of Lambton Shore near Lake Huron found out where it stood when it mused about creating a community, Port Franks, free of wireless radiation as did Oakville when it introduced its own protocol calling for a 200-metre setback. “I went to that meeting in Oakville where it was discussed and it became very clear from Industry Canada and Health Canada that they were not going to change, they were not listening. They were there to dictate,” said Frank Klegg, a retired Microsoft Canada president, who is now head of Citizens For Safe Technology (C4ST). Klegg said C4ST wants to work with the federal government to establish so-called white zones across the country where people who are sensitive to wireless radiation can seek refuge. Oakville Mayor Rob Burton said the federal government doesn’t even consult the municipality on 95 per cent of the applications to erect cell towers and for the remaining 5 per cent he suggested the consultation is little more than lip service. “What shocks me is the federal government pretending that we have a say,” Burton said. “Our protocol is designed to get us out of the line of fire . . . we have turned away seven or eight now (but) then the proponent then goes to Industry Canada (which) gives them the go-ahead,” he said.